The Internet and Social Media have changed the development process for many of the products we use. 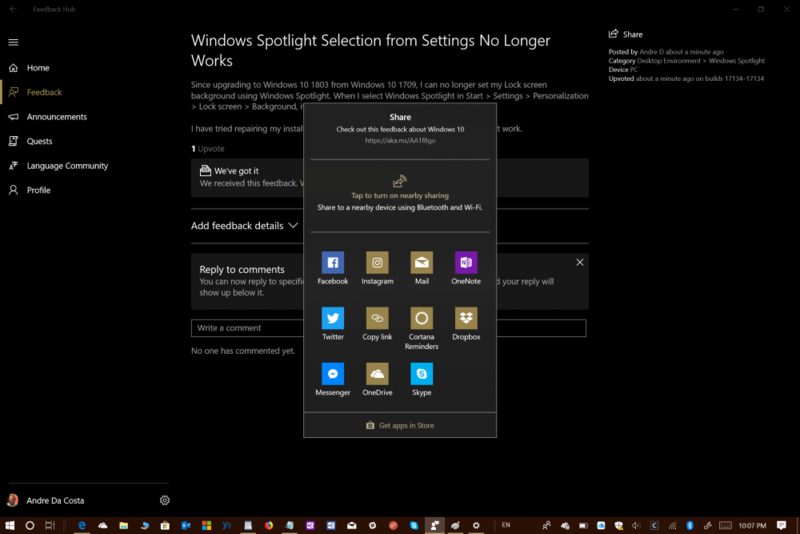 Windows 10 in particular has embraced the benefits of these modern day platforms to help improve and bring new releases to market approximately every six months. When I participated in Microsoft Beta Programs (remember Microsoft Betaplace and Connect) more than a decade ago, it was sort of an exclusive club of maybe few thousand or more. Although both had its benefits, with the significant growth of Windows and Office, there had to be change to make feedback represent the billions of users who use both. Since Windows 10 launched in October of 2014, Microsoft has made submitting suggestions and problem reports about Windows open to the general public and not just a controlled group. Instead of just getting an acknowledgement your bug has been received, there is tremendous opportunity to actually have engineers act on your problem and to engage with them intimately. This results in timely fixes not just in the next release but also the interim. In this article, we show you the basic steps to submit a bug and get it acknowledged and potentially fixed in a cumulative update. 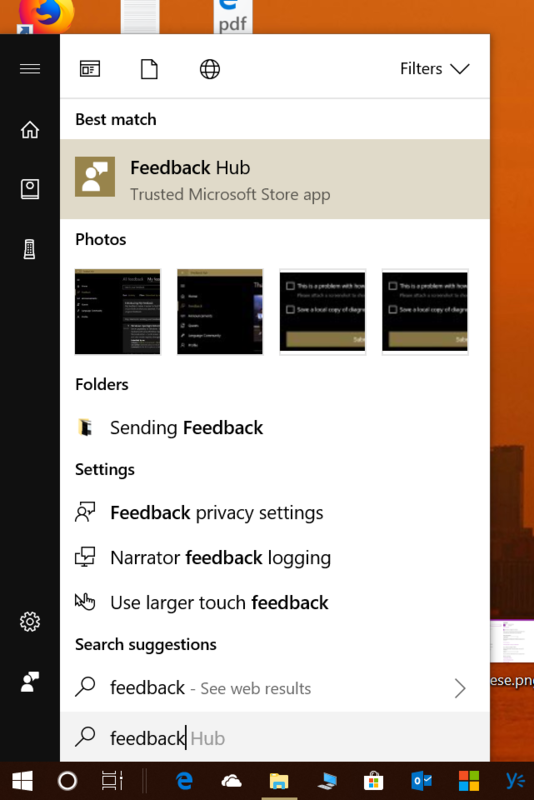 Included with Windows 10 is an app called Feedback Hub. 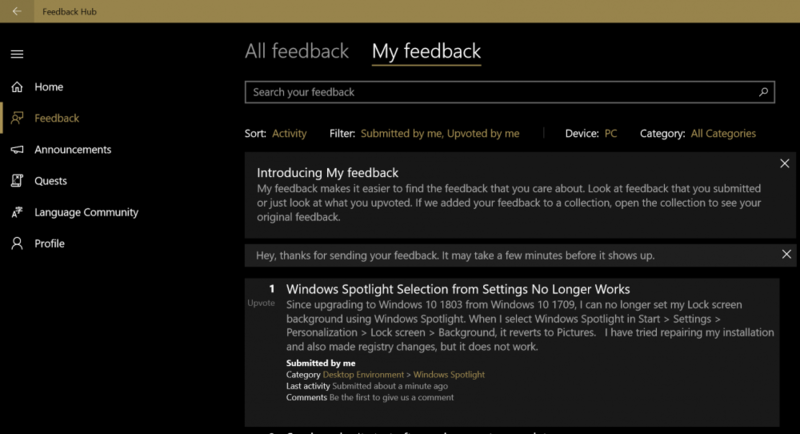 You can launch it by opening Start, type: feedback or scroll down to ‘F’ then click Feedback hub. After launching Feedback hub, click the Feedback tab. Choose the kind of report you want to send to the Windows Engineers. This is important, because there is a difference between tweeking something versus fixing a bug. A suggestion could be add the option to have different mouse pointer colors. A bug could be, every time you click the Start button, it does not open or the Microsoft Store app presents an error every time you launch it. Error codes and the ability to reproduce the error you are experiencing is important. Some issues you might experience in Windows 10 could be attributed to anomalies or network problems. So, make sure you have exhausted all the troubleshooting options before you submit a report. For instance, if you are unable to connect to the Internet, make sure your drivers updated; you have ran the built in troubleshooters (Start > Setting > Update & security > Troubleshooter) and even Restart the device. When you have decided which one you would like to submit, choose the appropriate radio box. For this article, I am going to submit a ‘Problem’. Below that, enter a descriptive title for your problem. What is the exact make and model of your computer? What have you done so far to troubleshoot the problem? Have you installed any new software or hardware drivers since you started experiencing this problem? If so, what are they and are they designed for Windows 10? Have you checked the manufacturers website or contact support to find out about compatibility, updates or support for Windows 10? Do you have a system restore point created you could go back to? Does the problem occur in other user accounts on the computer? Which version of Windows did you upgrade from: Windows 7, Windows 8.1, Windows 10 1507, 1511, 1607, 1703, 1709? Please avoid rants, off topic discussion, profanity and insults – be respectful. Engineers are reading your feedback and instead of telling them about your history in computing and personal problems, they would rather know about the problem concerning Windows 10 at hand. You will also have the opportunity to provide follow up replies. Choose the category the problem relates to. Since my problem affects the desktop, I will choose the ‘Desktop environment’, specifically ‘Windows Spotlight’. If your issue relates to Microsoft Edge, choose that and the area of Edge affected. Next, add evidence of the problem. The Feedback Hub makes it easy to add examples of the problem you are experiencing. This is especially great for reproducible bugs. You can attach a screen capture, file or recording. For my bug, I will go with with Recreate my problem. When you are ready, click Start capture button, then go through the steps to reproduce the problem. When complete, click Stop capture. The information will be attached automatically. You can still remove or review the recorded screenshots used in your recording. You can also keep a copy of the feedback if you want or go ahead and immediately Submit it for review. If you want to review your report, click the ‘Continue using Feedback Hub button’. Click the My feedback tab, then click on the report, which should be at the top of the list. Here is how you can make some noise and give your report the attention it deserves. You can share the report with family and friends or even key folks on the Windows Engineering team. Click the Share menu at the top right hand corner of the Feedback hub screen; a Short Link will be generated. 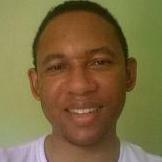 Click Copy Link, which you can send in an email or instant message; or click Share for more options. If you have Twitter installed, you can launch that app. 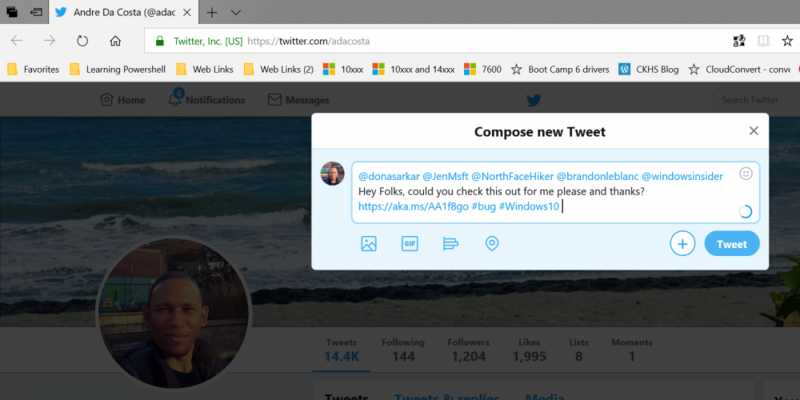 You can tweet the problem to key folks on the Windows Engineering team or find folks who work on specific parts or apps bundled with Windows such as Photos. Not everyone is on social media, so this is completely optional on your part. Enter a short description, a few hash tags and Tweet it out. 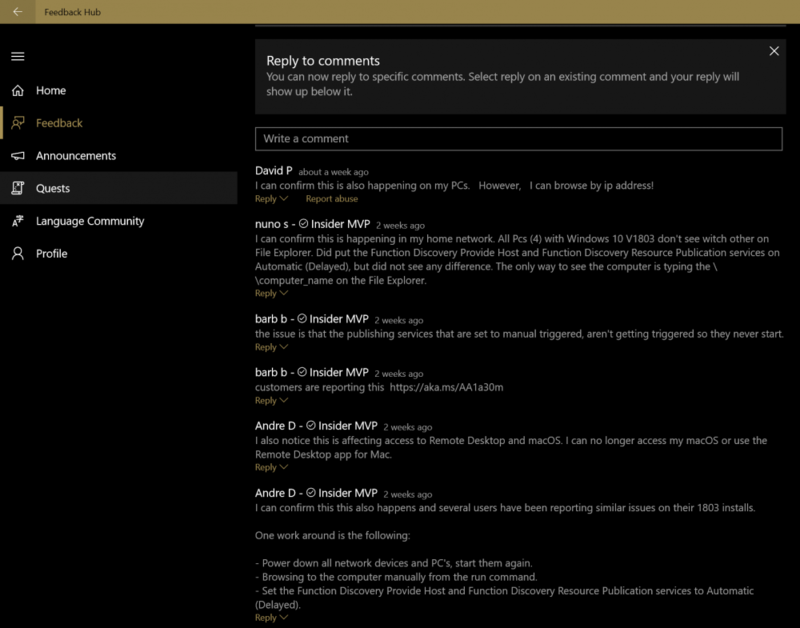 If you know a Windows Insider MVP, you can share your feedback with them and let them vote on it for you too. Windows Insider MVP’s are considered as customer advocates and represents a small group of enthusiastic Windows 10 users who love helping fellow users get the most out of Windows. 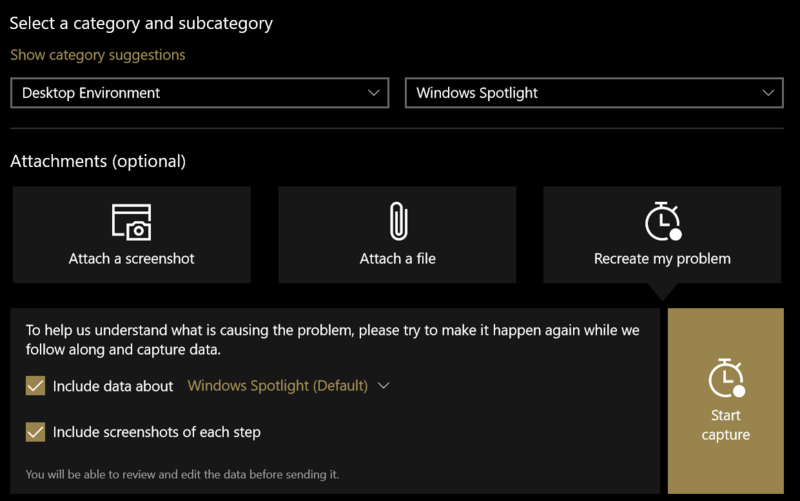 There you have it, an easy way to get your Windows 10 problems acknowledged and potentially fixed.